I know that in a few weeks we will be spending 5 weeks together LIVE talking about the many ways that you can improve clinical outcomes while also increasing your private practice income. But, I wanted to talk about something amazing and tangible that you can start doing TODAY in private practice. While you can do this ANYTIME (and you should do it regularly), this is something that is lovely to do at the close/start of a year. Anyone who has heard Kelly Higdon and I speak, has read this blog consistently over the last 10 years, or has been through our Business School Bootcamp for Therapists has been challenged to integrate an outcomes process into this work. Why? Because tracking outcomes is powerful, both clinically, and financially. Scott Miller was involved in some great research and has written extensively about what really is associated with great clinical outcomes, and it isn’t what people think. If you haven’t read his article SuperShrinks yet (or lately), I HIGHLY recommend clicking here to give it a read. What Makes Some Therapists Great? What Can You Start Doing With Every Client Today to Improve Clinical Outcomes? Ask them for feedback. Give them space to give you real feedback. What could we have done today to make this better? Is there anything we missed? If something isn’t working, please let me know. Do you remember how you felt when you first called for therapy? What else would need to change for you to feel like this was truly a success? What are your favorite moments that you’d like more of? What hasn’t worked as well for you, or that you’d like less of? Why Integrating Outcomes Into Private Practice is Awesome! They get to see their client make realizations about the progress they’ve made that they might not have fully realized until they took a moment to assess. They get to learn more about what is and isn’t working with this particular client so they can use that in the treatment planning process. They get to reach the client beaming with pride about the progress they’ve made. And, they get to go deeper into making plans and getting clarity about the work that is really left to be done. Therapists also often learn more about what they bring to the clinical relationship while helps increase their clinical confidence. Therapists can also use this information to more fully align their business model and marketing to give potential clients a clearer picture of what working with them will be like. But Does Integrating Outcomes Actually Improve Your Income? Do people refer to something that they don’t feel good about? How often have you simply faded away from a relationship that wasn’t working because you didn’t feel brave enough, or that there was space to ask for what you needed? Have you ever made AWESOME progress with a client and then gotten to a place where therapy becomes more of a friendly check-in? If you can engage, re-engage, or prevent an early drop out from therapy- how does that impact your income? If you can get clear about who you get great outcomes with, you can focus on getting more of those clients, and getting great outcomes. At the end of the day, if you are attracting clients that aren’t getting good outcomes, they aren’t going to stay long in therapy, they aren’t going to refer your friends, or if they do stay- it will not be good for either of you! Clinicians who get focused on being really great at their craft have an opportunity to build a private practice with less effort and more reward! 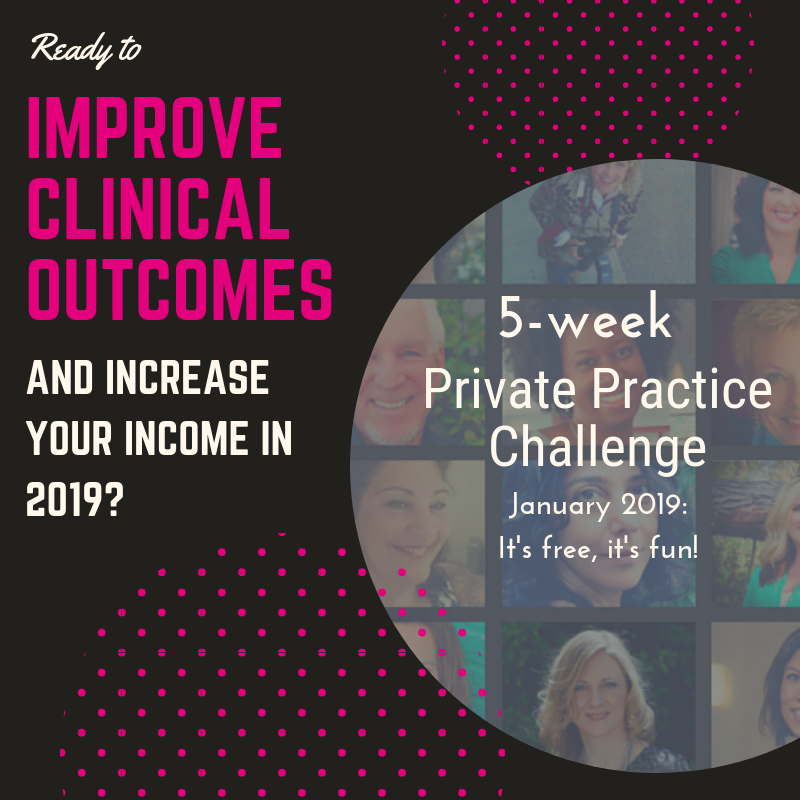 Are you going to be joining us for the 5-week 2019 Private Practice Challenge? We are going to be digging into what you can change in your business to improve your clinical outcomes AND make a better private practice income in 2019! Click here to grab your spot on the live training. We are expecting over 10,000 therapists to participate! Wowee!